The Trump administration is determined to quell the number of Central American asylum-seekers who show up at the U.S.-Mexico border. We spoke with several experts about the Central American migrants coming to the United States to seek asylum – who they are, why they’re coming, whether there’s a crisis at the border and how to address it. The Trump administration is determined to quell the number of Central American asylum-seekers who show up at the U.S.-Mexico border. Attorney General Jeff Sessions has unraveled protections in the asylum system benefiting women fleeing domestic violence and those fleeing gang violence – issues that impact most Central American women and children asylum-seekers. The administration also appears to be trying to keep asylum-seekers in detention as often and for as long as possible – something that decreases the chance of anyone’s success in immigration proceedings because of the isolation and lack of access to resources. Parents who seek asylum legally at ports of entry are being separated from their children. 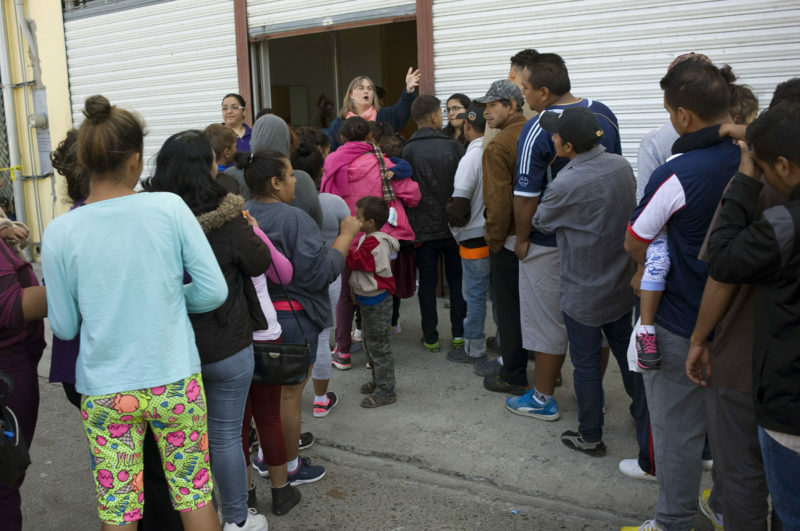 The Trump administration argues that the increase in families and children fleeing violence in their countries of origin and seeking asylum at the U.S.-Mexico border is a result of “loopholes” in U.S. immigration laws. Indeed, there has been a sharp rise in asylum-seekers from Central America’s Northern Triangle region, which includes Honduras, Guatemala and El Salvador. U.S. Citizenship and Immigration Services reports that more individuals from the Northern Triangle region sought asylum in the United States between 2013 to 2015 than in the previous 15 years combined. Since the end of the internal armed conflicts in El Salvador, Guatemala and Nicaragua — which together displaced almost 2 million people in the 1970s and 1980s—thousands of Central Americans traveled to the United States to escape poverty in their war-torn countries. Today’s migrant flow is different. While there are still men seeking economic opportunities in the United States, there are far more families, children and women escaping violence and extortion. Portillo says that to truly understand Central American asylum-seekers, you must understand the history of the countries they come from, dating back to the coup d’etat in Guatemala in 1954, a covert operation carried out by the U.S. Central Intelligence Agency that deposed the democratically elected Guatemalan President Jacobo Árbenz and ended the Guatemalan Revolution, which began in 1944. But for more recent history, she said, look at the 2009 coup d’etat in Honduras, when the Honduran Army followed orders from the Honduran Supreme Court to oust President Manuel Zelaya and send him into exile. That led to the most violent years on record in the country, starting in 2011. That year, 2014, is when the U.S. saw a surge of unaccompanied minors from Central America arrive at the Texas border. El Salvador and Honduras started seeing hundreds of women murdered each year, with few investigated at all. Portillo noted that there has always been discrimination against Central American asylum-seekers in the U.S. immigration system, because allowing them in as refugees would be an admission by the United States of its role in the instability of those countries. She points to a court case following a 1980s spike in Central American migration caused by civil wars that alleged discrimination against Central American asylum applicants. Central Americans continue to have dismal outcomes in asylum cases, with around 80 percent of all applications rejected, according to the nonpartisan Transactional Records Access Clearinghouse at Syracuse University. Meade said a big part of the trend toward more desperate asylum-seekers is the increase in border security, which has rerouted migrants through the desert and forced them into the hands of smugglers and organized crime, making it more dangerous to make the journey to the United States. Part of the perceived crisis, he said, has less to do with sheer numbers and more to do with an increasingly high-needs population coming to the border, like women and children fleeing violence. The number of families and unaccompanied minors still represent only about a third of total border apprehensions, which are at an all-time low, he said. Bersin thinks it’s problematic that changes to the asylum system are being dictated through courts, not through legislation. Bersin said the United States should be working more with Mexico to take on some of the asylum-seekers. In general, asylum applications there have been on the rise. But Mexico’s asylum system is inconsistent and lacks resources. There should also be “safe zones” in Central American countries, Bersin said, where people can be processed in their own country to receive humanitarian parole – a system more akin to the refugee system. While knowing the United States does sometimes extend protections helps, what really drives Central American migrants to come to the United States is the fact that many have relatives here. There’s also a long history of Central American migrants seeking new opportunities in the United States. There have been long-standing military, diplomatic, economic and labor connections between the United States and countries in the Northern Triangle. For example, even when El Salvador was relatively peaceful, early waves of Salvadoran migration to the United States can be linked to the commercialization of coffee, Menjívar said. Members of El Salvador’s coffee-producing elite settled in the San Francisco area, which was the chief processing center for coffee from Central America, as early as the beginning of the 20th century. “The longtime U.S. presence in Central America created conditions for people to migrate to the U.S.,” she said. People who are trying to enter the United States both from Mexico and Central America generally cite very specific circumstances they are looking to flee, Jacobs said. There is often a story about a relative or multiple relatives getting murdered, or a change in political dynamics in their city that caused them to be fearful. Jacobs said that violence against women has been climbing in the region for about 10 years. That’s also when the gang cases started heating up. She, too, believes many Central American asylum-seekers end up in the United States because they have family here. Gangs like MS-13 were created in the United States, in immigrant neighborhoods in Los Angeles, by Central American refugees and their children. Large-scale deportations in the ‘90s exported them to Central America, fueling much of the violence that migrants are now fleeing. On Sunday, leftist candidate Andres Manuel Lopez Obrador won Mexico’s presidential election in a landslide. Here are five takeaways from the election from the New York Times – the first is voters’ rejection of the status quo. The Union-Tribune also checked in with California-residing voters who crossed the border to vote. Next Monday, July 9, federal courts in San Diego and El Centro are expected to implement Operation Streamline, a program that would fast-track illegal entry prosecutions that have been overloading the Southern District of California since “zero-tolerance” went into effect in April, writes the Union-Tribune. Most of the people charged with misdemeanor illegal entry plead guilty. They often do so to get out of custody as soon as possible, since many can’t afford to post bond. But the first handful of illegal entry cases that went to trial in San Diego under “zero tolerance” were dismissed. Someone has set up a Go Fund Me page to raise money for bond funds for the defendants facing illegal entry charges. NBC produced a “Dateline” special on the border.